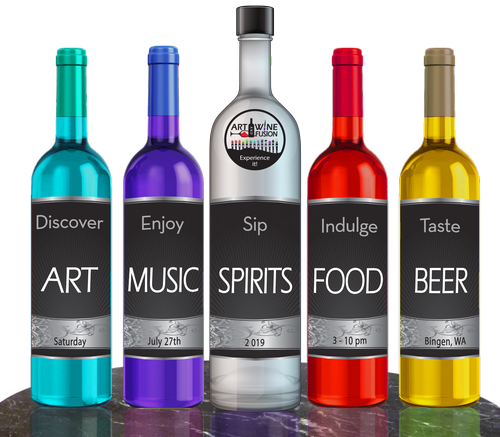 The premier summer festival in the Columbia River Gorge is an annual showcase of our local and regional artists, craftspeople, wineries, ciders, spirits, micro-brews, culinary treats and live music. Bring your picnic blanket and spend an enjoyable afternoon listening and dancing to the entertainment from a line-up including local and regional favorites. Hang out in the beer garden or get the Tasting Package and spend some time sampling many diverse wines, ciders and hard spirits in the Tasting Tents. Family activities will be happening throughout the afternoon. With the scenic backdrop of Mt. Hood and the Columbia River Gorge - White Salmon is THE happening place to be if you want to have a good time! This is a 21 and older event. Well behaved pets on leashes are welcome. Daubenspeck Park, at the corner of Franklin St and Humboldt, just a block up from Hwy 14 and the main downtown sector of Bingen, Washington. Located in the western end of Klickitat County on the sunny north shore of the Columbia River Gorge.